I don’t say this bragging; I say it because it’s true. And no, I’m not conceited but I’ve had more people than I care to count tell me, and my family, that they don’t normally like egg rolls but they like these. What’s so different or unique about these that nay-sayers try them and like them? I don’t have a clue but it’s remarkable. You’ll have to try them, regardless of whether you, or somebody else makes them using this recipe. You won’t regret it. And what have I told you before? Trust me. There’s personal history to this recipe and it all started with a flat tire. Seriously. Warm up your coffee and I’ll tell you about it. Several years ago, Randy, a member of the congregation (also a member of the Missions Ministry), was traveling on I55 when he stopped to help a guy with a flat tire. Lazarus was from Myanmar and spoke very broken English. As the two guys worked to get the car drivable again, they began to get acquainted. Lazarus was here in the states with his family attending Lincoln Christian University in Lincoln, IL, just a few miles from the church. As they talked, Randy told him that the church was looking for a missionary to sponsor, and from there was formed a wonderful bond between Lazarus Fish and the Elkhart Christian Church family. No, the guys didn’t exchange recipes right there – hold on I’m almost finished. One Sunday the church had a potluck that Ocha, his wife, brought a cookie sheet stacked high with egg rolls. Before the meal was over, every last egg roll was gone. During the course of Lazarus’ training, he was required to attend a class for three months in Kentucky. It wasn’t feasible for the whole family to go so Ocha and the kids stayed in Lincoln. While he was gone, the ladies of the church tried to come up with some social activities for them to help time pass a little more quickly. Since Ocha spoke only a few words of English, our choices were really limited. We finally came up with the idea to ask her to teach us to make her egg rolls. 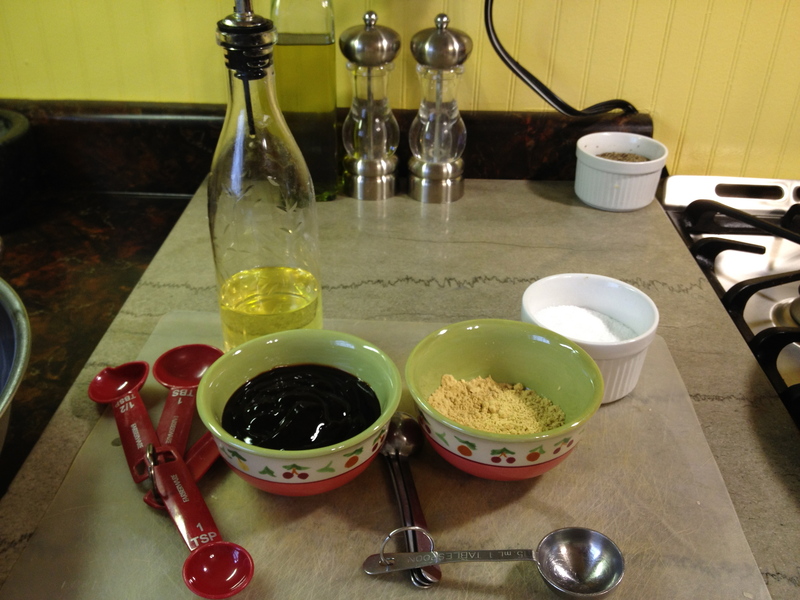 To get the recipe, we watched and wrote feverishly, getting measurements and instructions as the process unfolded. Even though Ocha didn’t speak but a few words of English, when it comes to cooking and sharing food, there are no communication barriers. It’s a special form of communication – one that requires no words, just the act of sharing. A special bond was formed that night between Ocha and the ladies of Elkhart Christian Church, all because a guy’s tire went flat. The Lord works in mysterious ways! I want to preface this recipe by saying the instructions look far more daunting than they actually are. Believe it or not, these instructions are shorter than War and Peace. Don’t feel overwhelmed or ill-equipped to do this. You can do it!! 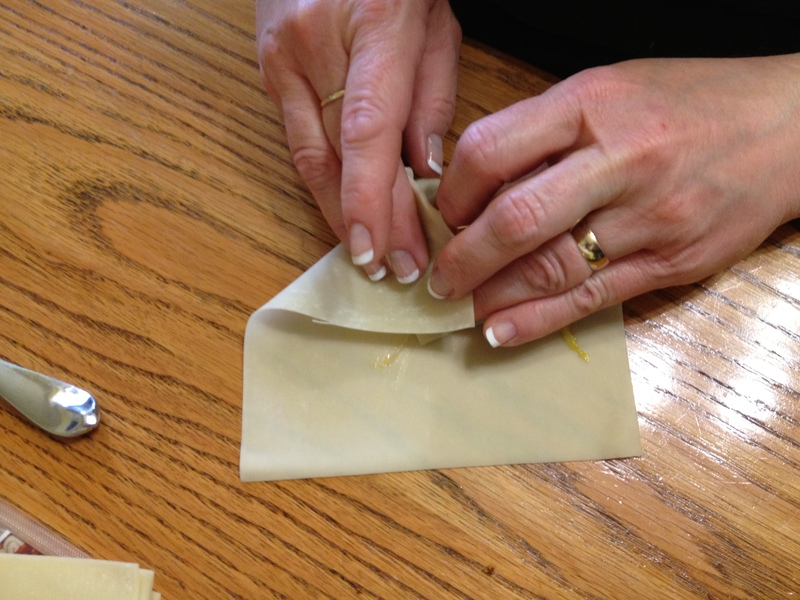 There are actually only 3 steps; making the filling, the rolling, the frying and eating. Well, okay, 4 steps. This is a great get-together recipe to make with friends. Everybody can have a job – or not – and reap the benefits from the labor of several or a few. 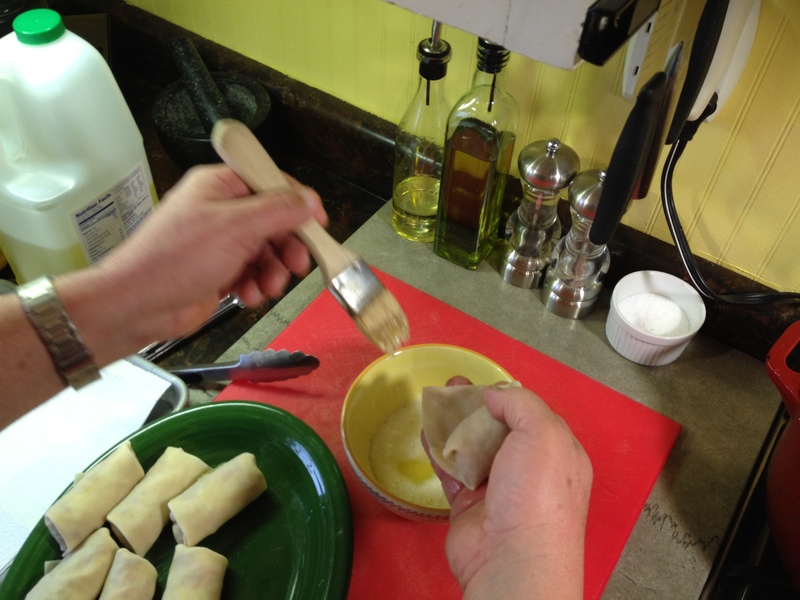 This recipe can make roughly 60 egg rolls; it depends on how fat or skinny you fill them. We make both fat ones (for the veteran egg roll lovers) and skinny ones (for the skeptics and newcomers of the egg roll world). Certainly you could cut the recipe in half with not much trouble, however, most packages of wrappers come in quantities of 20. We make these quite frequently to be honest. We’ve made them for our family Christmas Eve get-togethers for years, my hubby gets requests for them periodically from the guys at work and sometimes we make them for our family and give the rest away. These can be the whole meal or you can serve them with an entree – we do both. I made just the filling by myself when I did the pictures for this posting. We like to make the filling the day before – if time allows – so the flavors have time to marry (and enjoy their honeymoon) before we roll and fry them. Don’t worry if you don’t have the time to do that – it’s not a big deal. Whether using the slicing blade on your food processor, a mandolin or slicing by hand, you want the cabbage to be sliced fairly thin – oh, and NOT chopped. 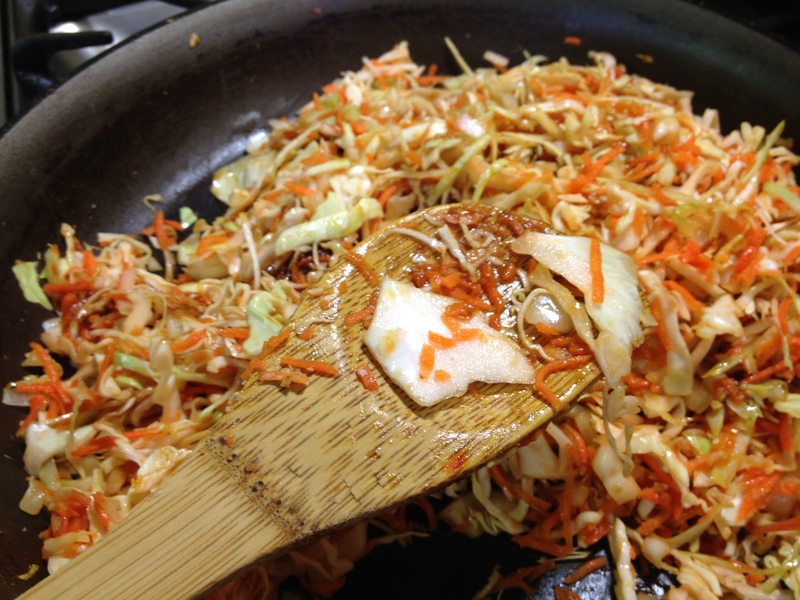 Chopping the cabbage will give it a nasty consistency – don’t go there. Also, be sure to cut the center of the cabbage away. 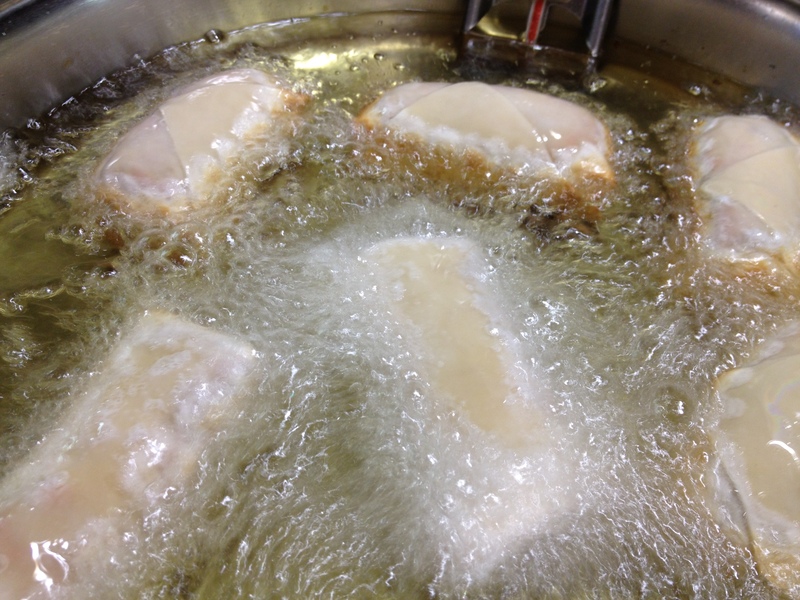 The center is too dense and takes too long to wilt in the short time the filling is in the skillet. Just wanted to give you an idea of how thinly the cabbage should be sliced. 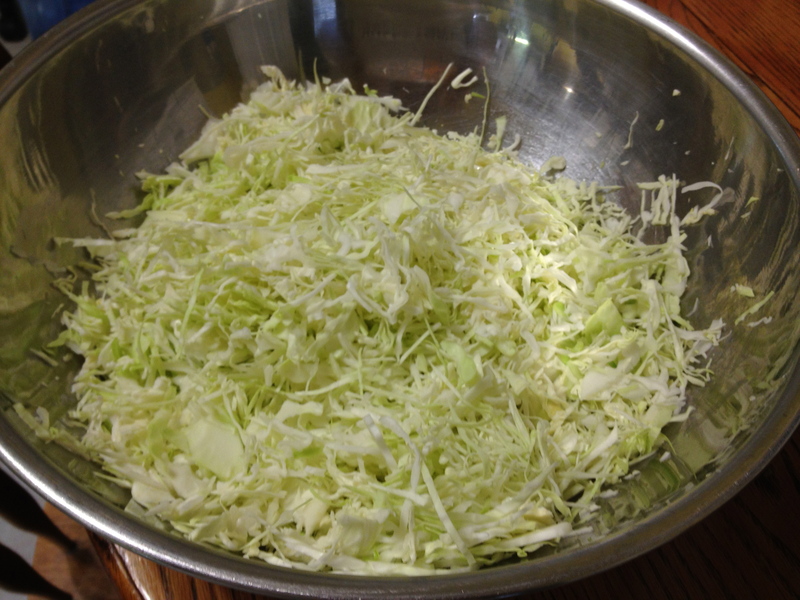 After the head of cabbage is sliced, put it in a LARGE bowl. 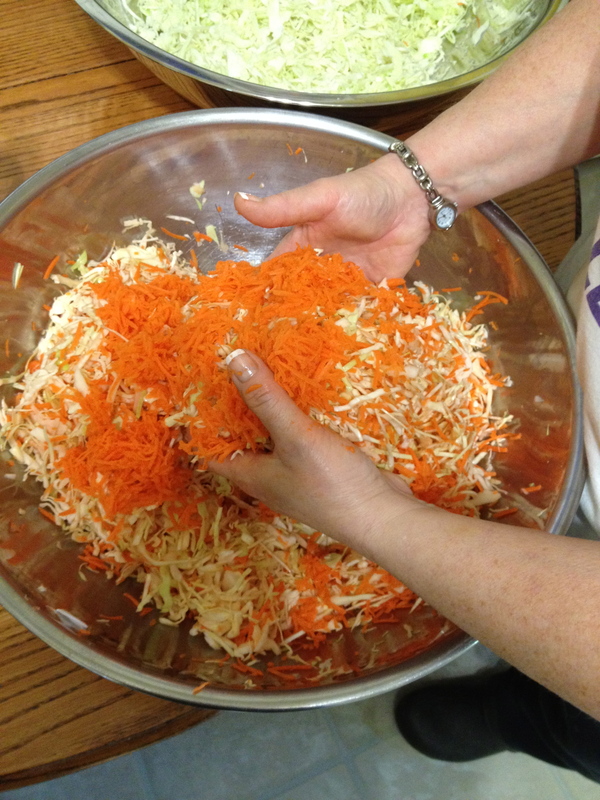 You can, or not, peel the carrots before you shred them – it won’t change the taste of the filling. If you don’t peel them, be sure to give them a good rinse. 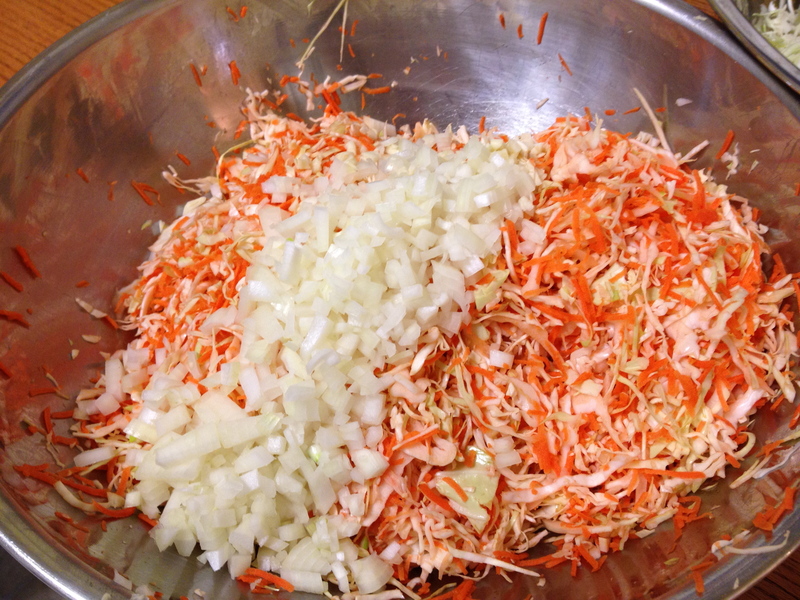 Again, the carrots need to be shredded rather than chopped or sliced. I just had to show off my Christmas present from my hubby last year. 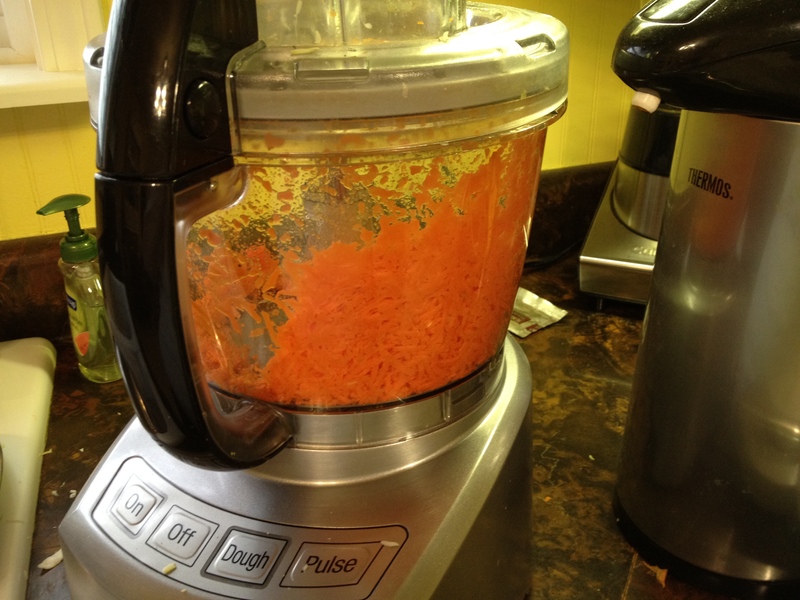 I love, love, love this food processor! It’s a 14 cup capacity Cuisinart with the 3 bowl sizes. This is where I make the Tim the Toolman grunt noises. 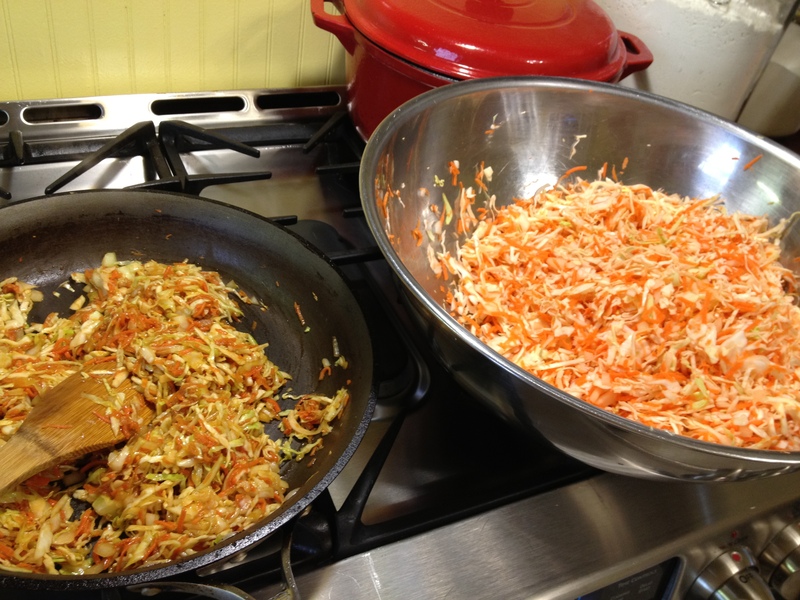 Add the carrots to the cabbage and, using your best tools – your hands – thoroughly mix the cabbage and carrots. Also, be on the lookout for any rogue chunky pieces of cabbage and carrot. You want to make sure everything is as close to the same size so it will wilt evenly. Oh, and don’t get confused by the other bowl of cabbage sitting there. That’s for cole slaw later. It’s not even really there! Cut the sweet onions (if you don’t have sweet onions on hand just use what you have – except purple) into a small dice. Nothing microscopic, just not too large. The green onions should be kinda thin. If by chance you forgot to pick up the green onions at the store – like I did when I made these – just use a little bit more of your regular onion. The green onion does, however, give the filling more color (and you eat with your eyes first). 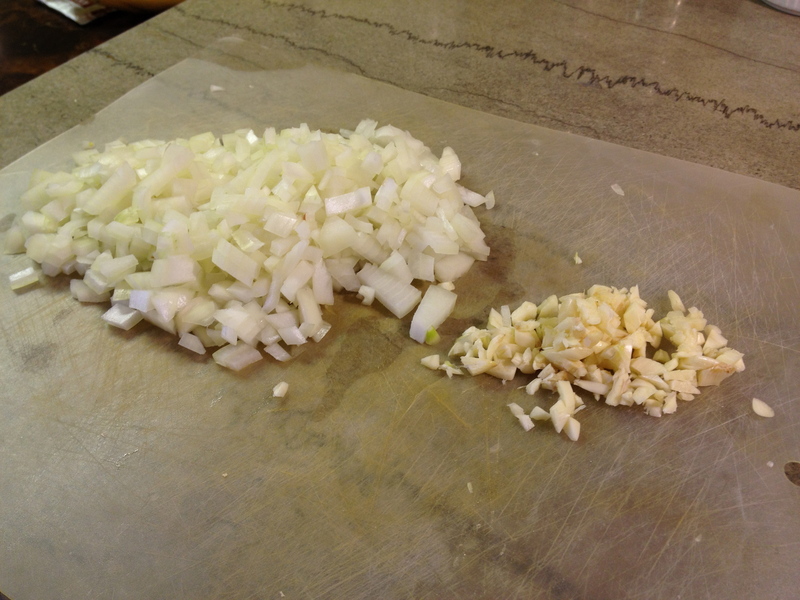 This is just an example of the size dice I’m referring to with the onion and garlic. You’ll see what might look like some long pieces of onion but actually, they’re “tall”. They’re just still layered together. 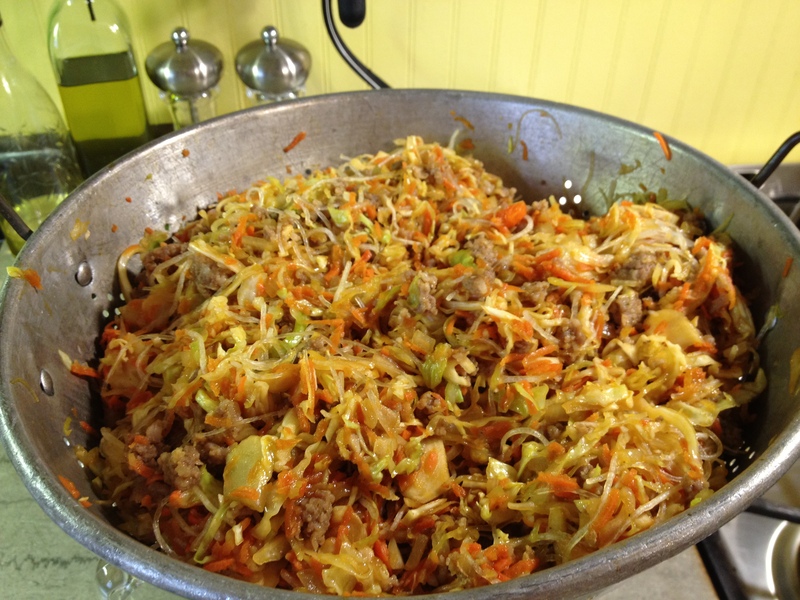 Add the onions and the garlic to the cabbage and carrots. It really is better to mix after each new addition for a couple of reasons. 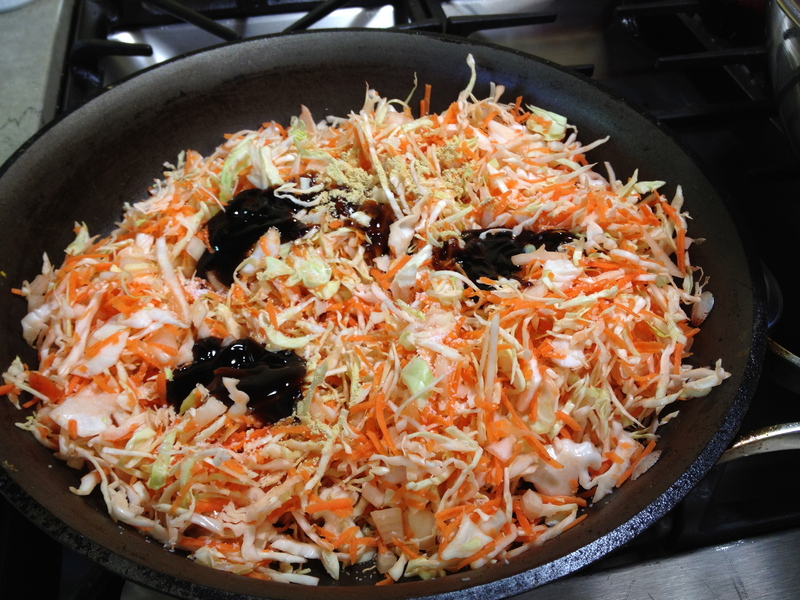 1) The carrots are an aggravating bunch that like to stay in little globs and are hard to separate, and 2) The more you mix, the more you will find those thick cabbage pieces that need to be tossed out. I know, seems like there’s a lot to look out for! Now it’s time for the green bean threads. 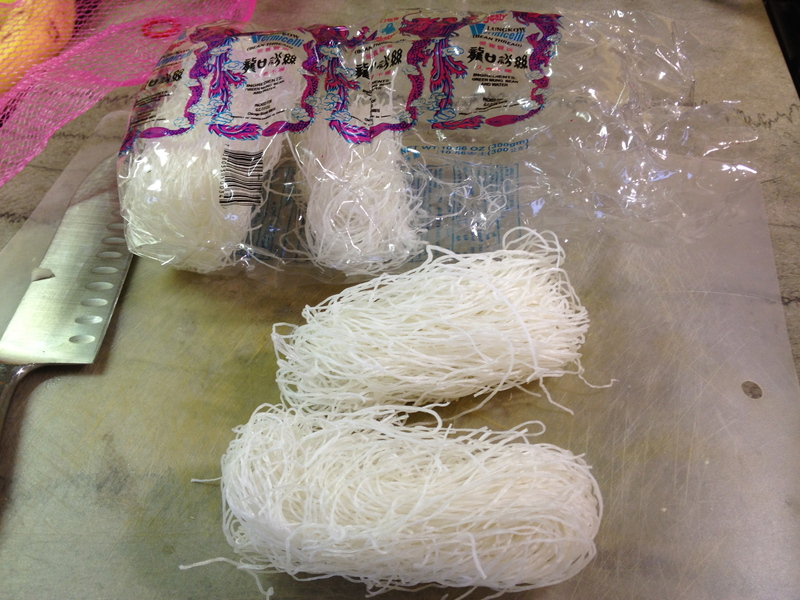 These are, in their dehydrated state, very thin little noodles wound in a bundle. They’re becoming more and more widely available in major grocery stores like County Market, Meijer and Schnucks. They’re in the Asian food section and pretty inexpensive. We buy them in bulk when we go to our local Asian food store. 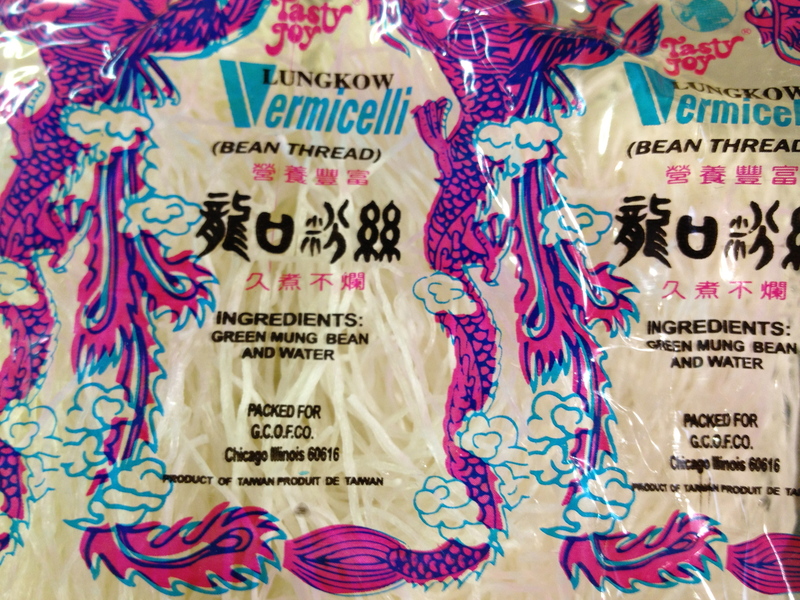 When you call your grocer and ask for green bean threads, you can let him know they’ll be in a bright pink mesh bag in the Asian food section. This is the only brand we’ve ever seen in all 4 places. Just in case you don’t have your computer glasses on I thought I’d give you a close up. Actually I wanted you to see the ingredients. I think there are 8 bundles in a bag. I don’t know what’s up with the bright pink mesh bag, but like I said, it’s a great way to help someone find/identify them. 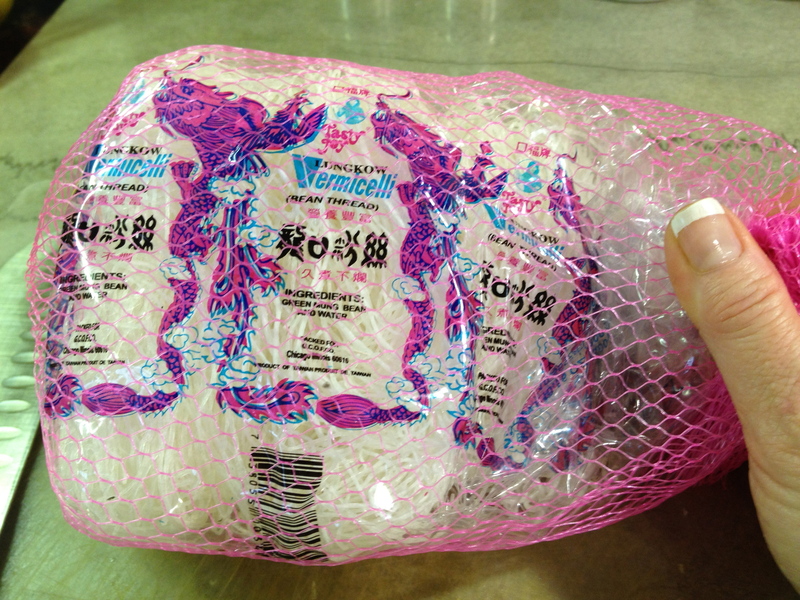 Side Note: We don’t usually replace the pink mesh on our packages of the green bean threads once we’ve opened them. We’ve been fortunate I guess ’cause we’ve never had any escape. Just sayin. These need to be hydrated in very warm water. 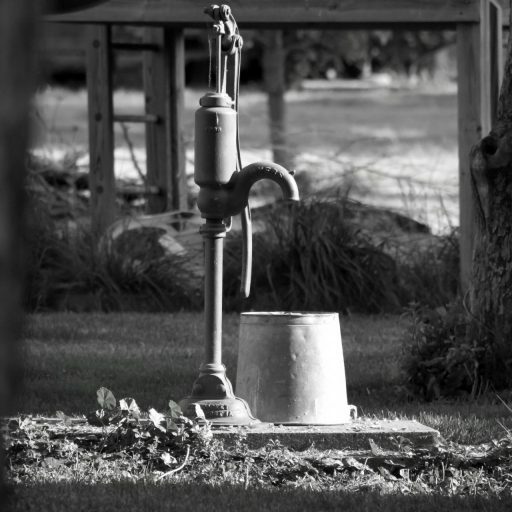 There are no measurements for the water, just enough to amply cover them. You can use between 2 or 3 of these bundles. They’re basically a filler and take on the most prominent flavor. It’ll take about 10 minutes to hydrate. While the green bean threads are in the spa, you’ll have time to prepare for wilting the veggies (we’ll come back to the green bean threads in a little bit). You’ll of course need a large nonstick skillet, a strainer set inside a mixing bowl to drain the filling, as well as the ingredients that we’ll add to each “batch” of the veggies. Here’s what the line-up looks like. To the far left is the colander set in a bowl. After the veggies are wilted, they go into the colander to drain. We’re adding salt to the veggies so that will make them release some of their water. Liquid is NOT a friend to an egg roll wrapper. I’m left handed and this is my setup but it’s whatever works for you. Gee whiz I’m impressed with how organized I look here! Please, show this picture to your family and friends! 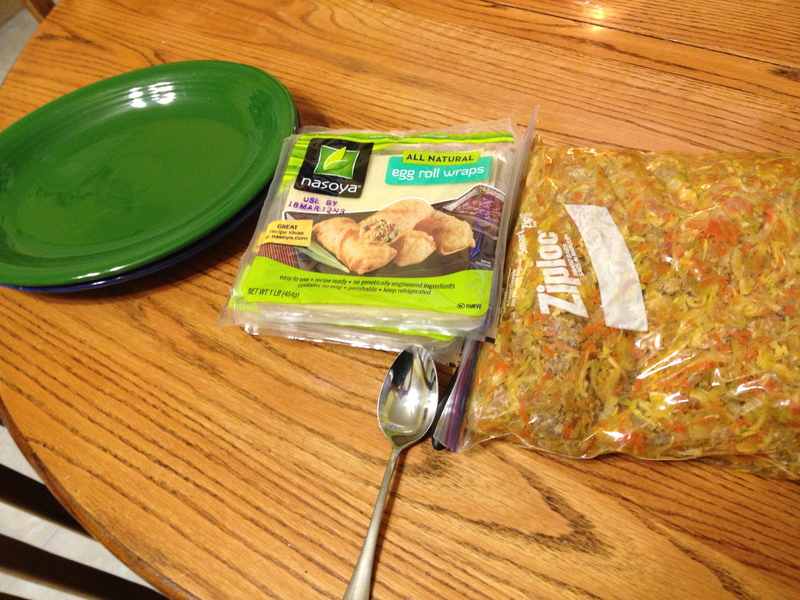 Here are the accoutrements for the veggies. In the back row on the plastic mat are (left to right): canola oil (veggie oil is fine too) and kosher salt in the ramekin. Kosher or table salt, either is fine – same measurement. In the front row (the black stuff) is oyster sauce. This too is something that’s easy to find in the larger grocery stores. It’s about $3.00 for a small bottle. You’ll need a total of 9 oz for this whole batch. In the second bowl is ground ginger. I just noticed that the red measuring spoon I have in front is the teaspoon rather than the tablespoon, which is what you’ll need. Follow the recipe rather than the picture. 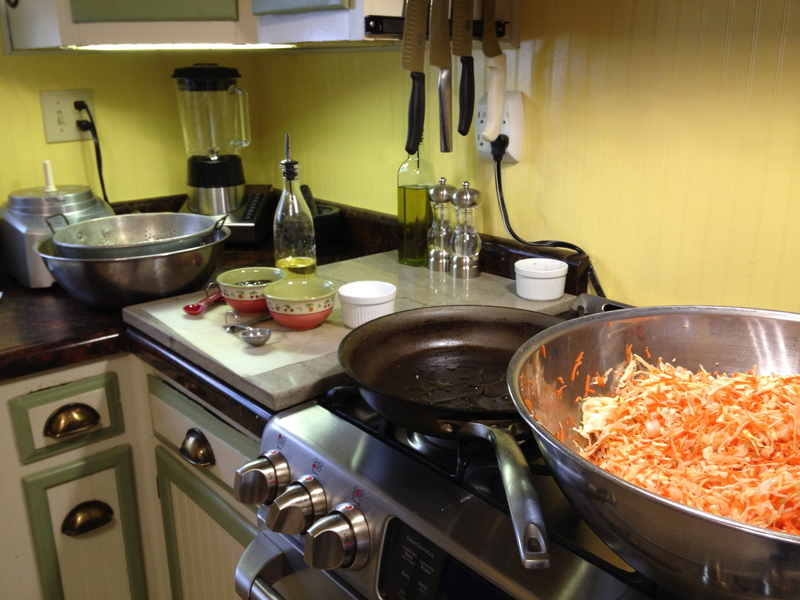 The veggies need to be done in 3 batches. If you try to do it in 1 or 2 batches (unless you have a ginormous skillet) it will take as long as 3 batches would and you’ll have a huge mess on your stove top. Been there/done that. It ain’t purdy. You need the extra room for stirring; this needs to be mixed very, very well. Believe me, you don’t want a bite of a pocket of any of these things you’re adding!! After adding the oil in the skillet, yes even if it’s nonstick, add a third of the veggies, then add the salt, oyster sauce and ginger. You don’t have to make a face in your veggies with the oyster sauce but I just think it’s a little entertaining. You’re cooking, you might as well have fun with it. Stir, stir and stir some more. The heat should be about medium high. While you’re stirring, be on the lookout for these guys. These are the tougher pieces of cabbage I was telling you about earlier. They have a stronger taste but most importantly they won’t be wilted by the time the rest of the veggies are ready, which means, they’ll be tough when you bite into one in the egg roll. Another reason is that if it’s on the outside of the filling, it might tear the wrapper. Just get rid of them; have them for a snack while you’re stirring or give them to the dog. He’ll love you. This is a comparison of the veggies that are “done” to what they look like raw. These are now ready for the colander. Just dump them in and let them rest to release their extra liquids. I said we’d come back to the green bean threads, well, here we are. Now they’re plump and limber. They do hold quite a bit of water and need to be drained. 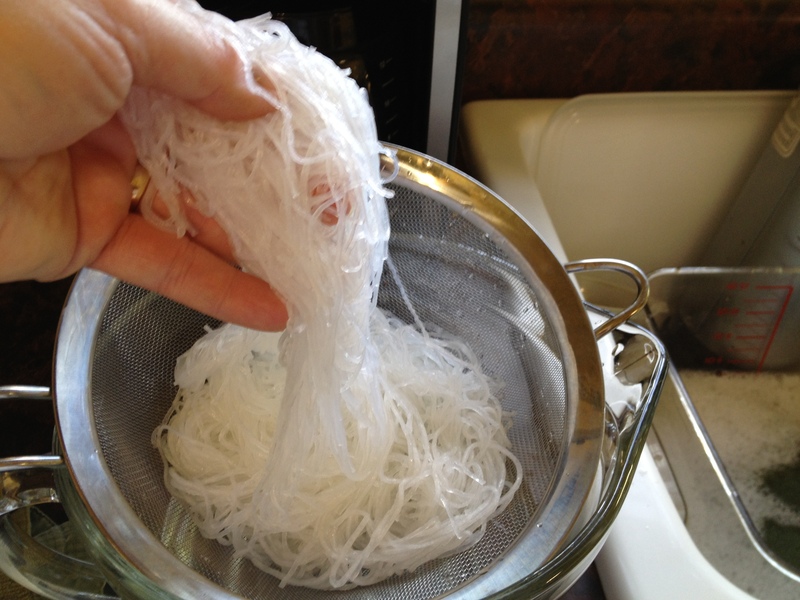 After they’ve been in the strainer for a few minutes, take them to the sink, cover them with your hand, and give the strainer and threads, together, a couple of quick shakes to get the excess water off. 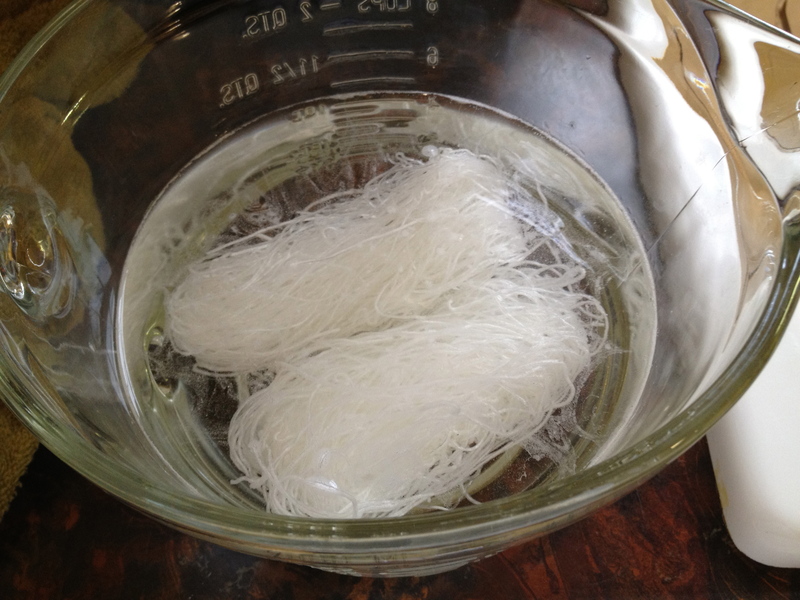 With scissors, cut the threads into about 2″ long strands. You can either hold them up over the colander and trim them from the bottom up or do like I’ve done here and just go all ninja on them. Show no mercy. Just don’t end up with rice-size pieces. These too will need to be added to the colander after you cut them in the strainer. Do not adjust your computer screen. This picture is messed up on just about every level but at least you get the idea. Ok, I admit it. I didn’t have a picture of frying the sausage but you’ll be ok on your own. Just make sure it’s browned completely. You can see what I browned that’s just under the green bean threads that are going on top. See how much filling there is?! Ahhh, light! This is the filling after it’s been thoroughly mixed. Stirring every once in awhile is really good because it rotates the veggies and allows even more liquid to drain. Let these go until they’re completely cool IF you’re not going to roll and fry them right away. As I said earlier, they taste better the next day (like spaghetti) but it’s not always the plan to wait. If you’re going to roll and fry them the same day, allow them to continue to drain. It’s time to get your rolling and frying supplies ready. 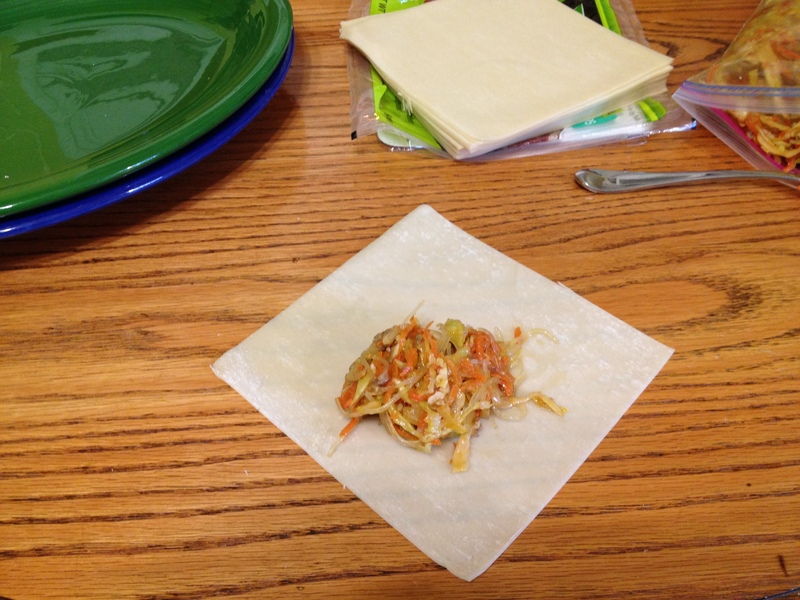 A platter or plate is needed to hold the wrapped egg rolls. It’s really important to keep the platter or plate completely dry. Remember I said, liquid is NO FRIEND to an egg roll wrapper. There are several wrappers on the market. There are some that are thin, almost like phyllo dough, and others, like these, that are more bready. We prefer these, which are like what you get in a restaurant. The filling here is in a ziplock bag because I’d made it the day before. 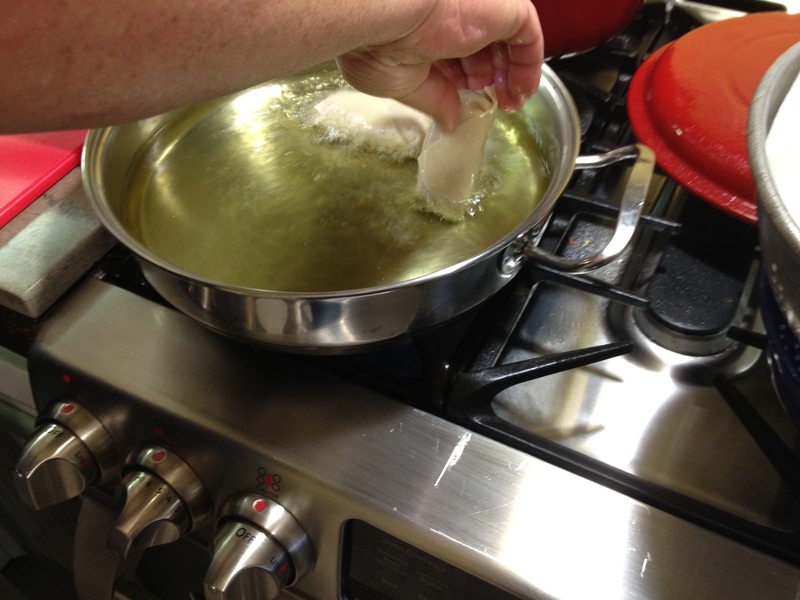 If you’re rolling and frying them the same day, keep the filling in the colander to allow it to drain while you use what’s on top. When buying wrappers, BE SURE to check for freshness. Omitting this step could be an expensive mistake. The edges of the packages are clear so you can see the layers of wrappers. There is also extra space between the wrappers and the top and bottom of the package. You should be able to easily fan the wrappers. Granted these are being fanned outside the package but they should be able to separate that easily inside the package as well. If the edges are stuck together, either bring it to the attention of the produce person or set them aside but don’t buy them. If you do buy them, most likely they’ll tear trying to get them apart. As I said earlier, that’s an expensive mess. The white powder between the wrappers is cornstarch. There’s just a dusting in between the wrappers to prevent them from sticking; it won’t change the flavor. Use just one wrapper at a time. Since you’re just starting out, it’s probably best to leave the other wrappers in the package; they do dry out. Turn the wrapper so it’s a diamond shape. You’ll see that it’s not and exact square but that’s okay. Put a spoonful of filling on the lower part of the wrapper. The spoon I’m talking about is a regular serving spoon. Don’t put the filling at the very bottom of the wrapper; we’ll need that area. 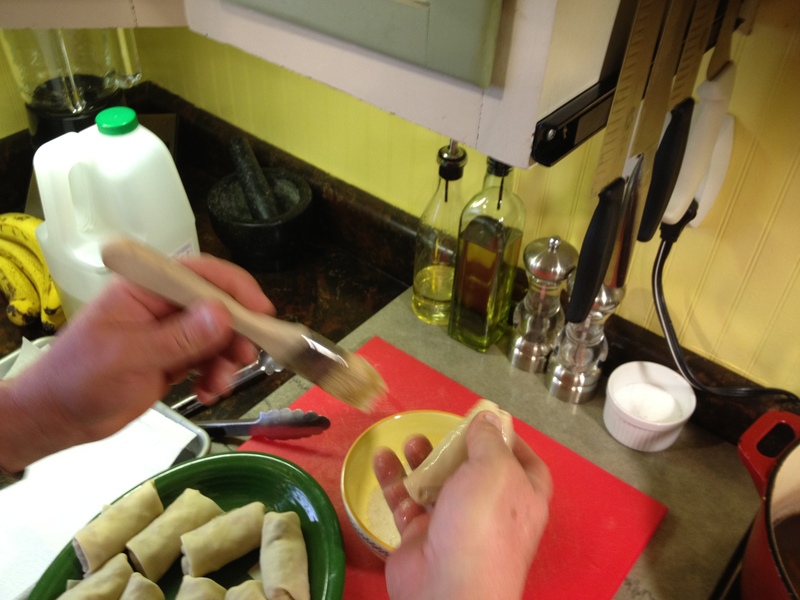 When you’re starting out learning to wrap the egg rolls, don’t exceed the serving spoon size. The more filling you add the less wrapper you have. 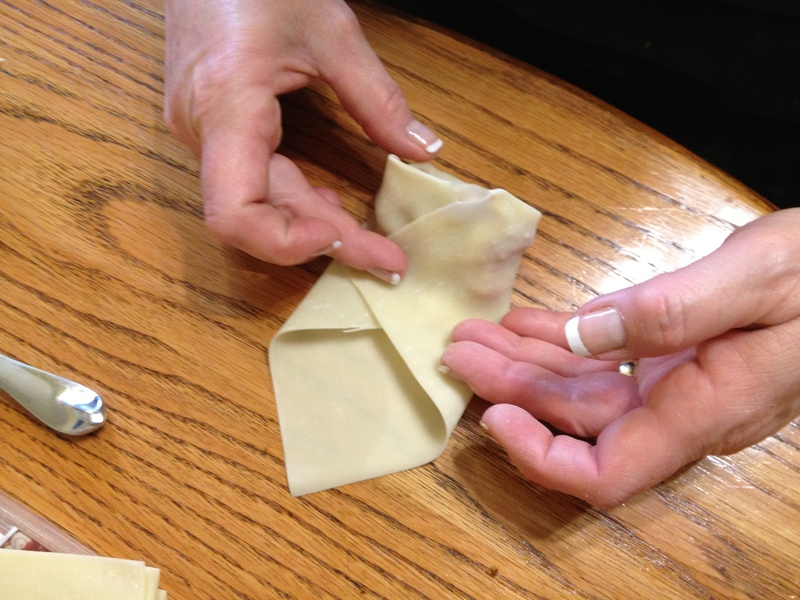 You can add more as you get better at folding. Get ahold of the bottom point of the wrapper and bring it up and over the filling going past it just a little bit. 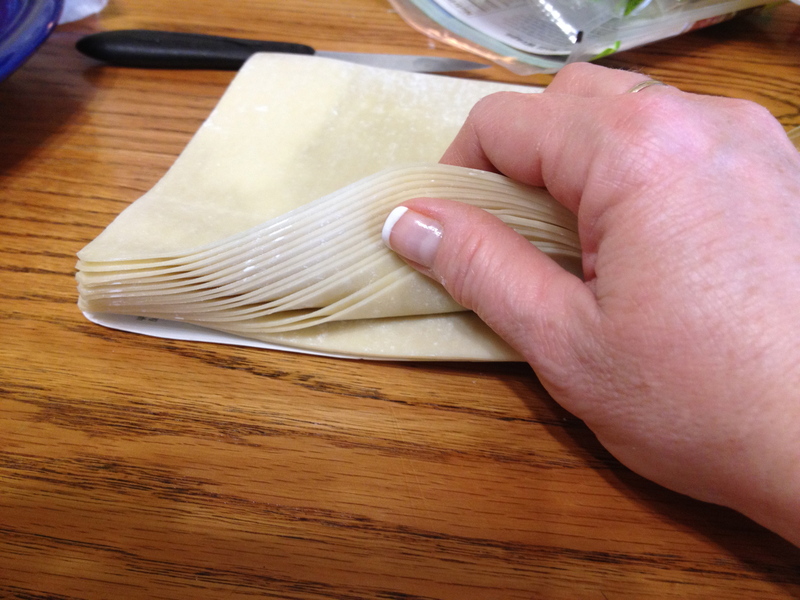 Now press down, just slightly, and drag the flap back until you hit the filling. 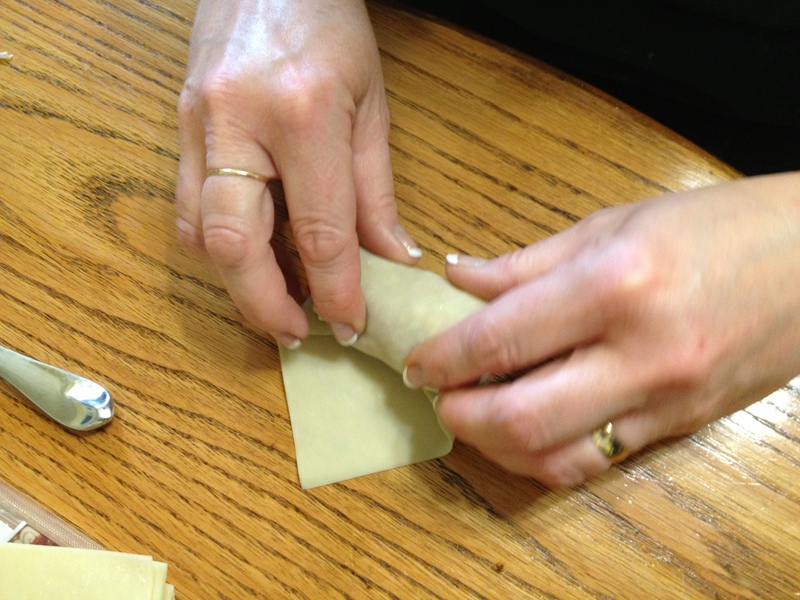 You want to apply just a little bit of pressure against the filling so it’s snug – not too tightly because you’ll tear the wrapper. Hold it in place. Remember I’m left handed so this is just how I do it. With your right ring finger, or pinky, swoop up the right corner of the wrapper and bring it to the center, covering the flap you just brought up from the bottom. This is now your new center. Hold it in place. Now switch sides! Use your left ring finger, or pinky, and swoop up the left side and bring it to the center, and hold it. This is now your new center. This is how it should look after both sides are brought in. Keep it snug. Look at those hands! Such a “ta-da” pose, don’t ya think. That’s glam baby! Now roll it forward. Roll. And roll. Lookin great! Two more. One more. Bring it home!! Oh, sorry. I guess I’ve been watching my new exercise video too much. Nicely done!! Wooo-hooo!! You’ve now completed rolling your first egg roll!!!!! And repeat . . . . . 59 more times! 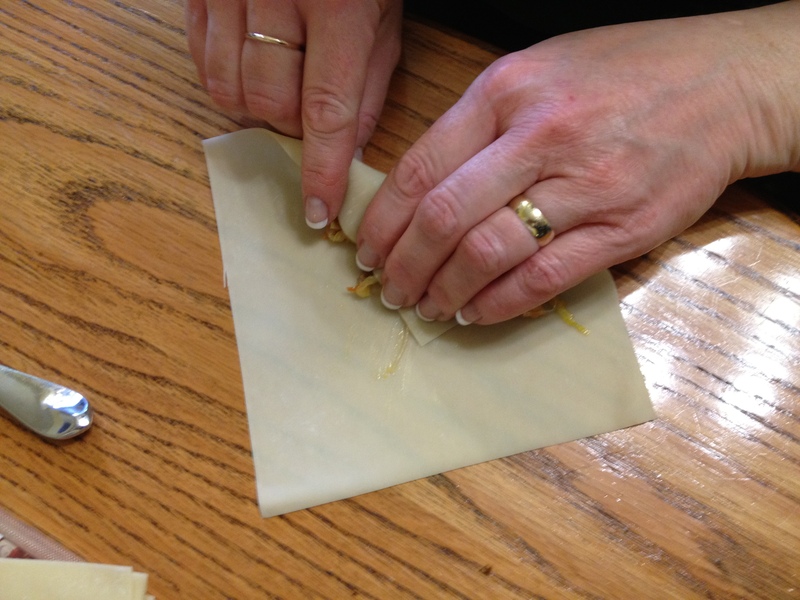 After you finish rolling the egg roll, put it on the platter seam side down. It’s very important to make sure the platter is kept dry. Liquid and a wrapper are not friends!!! They’ll stick to the platter and tear when you try to get them to let go. 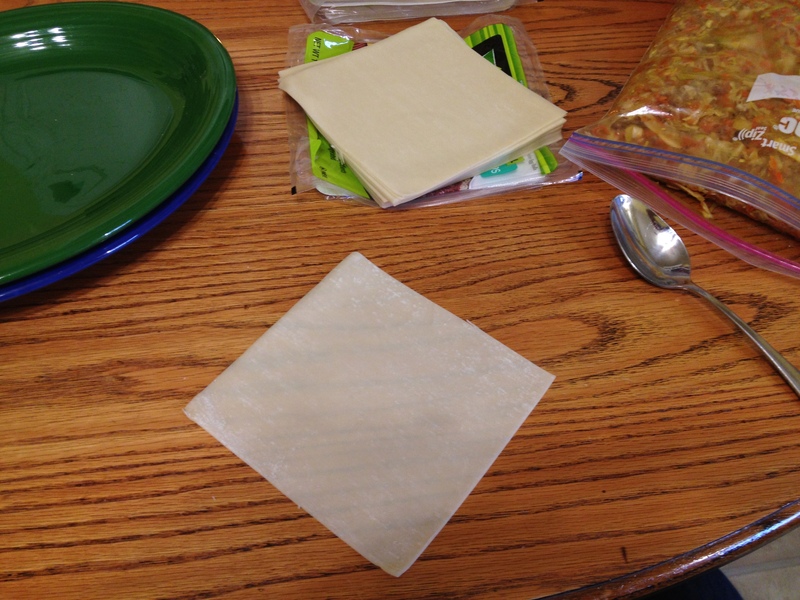 Oh yeah, by the way, if the wrapper of an unfried egg roll tears, unroll it, take the filling out and start with a new wrapper. It may seem wasteful but, take it from me, it’s a grease trap and it’s gross. Not worth it. Toss the bugger. 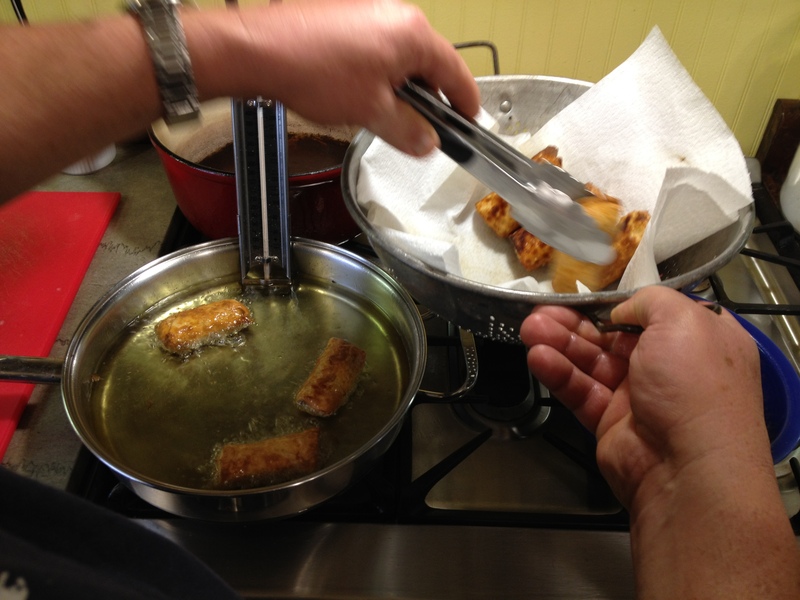 Also, do not brush the egg wash on the egg rolls until you’re by the skillet and ready to put them in the hot oil. If you wrap them and set them down on something other than the oil, you’re doomed!! They’ll stick and do what . . .? TEAR!! 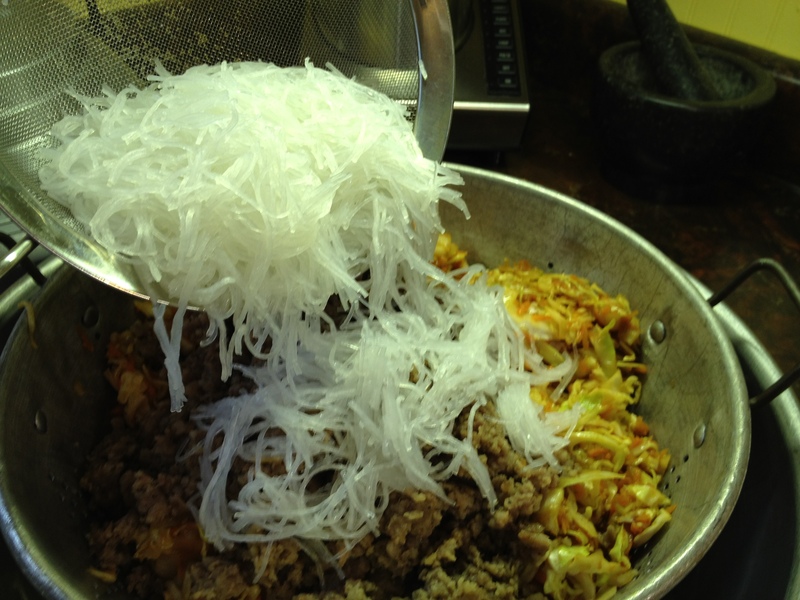 There are times when an egg roll will stick in the skillet. If that happens, don’t pull on it with tongs or anything else; you’ll tear it. Use a spatula (pancake turner) to get underneath it and scoot it over. Tom and I wait until we have a platter full before we start to fry. Then, while Tom’s frying, I have another platter I’m loading up for him. The egg wash is 2 room temperature egg whites and 2 teaspoons of tepid water. Room temperature eggs are pretty important because the whites will be looser and will mix faster and more easily with the water. 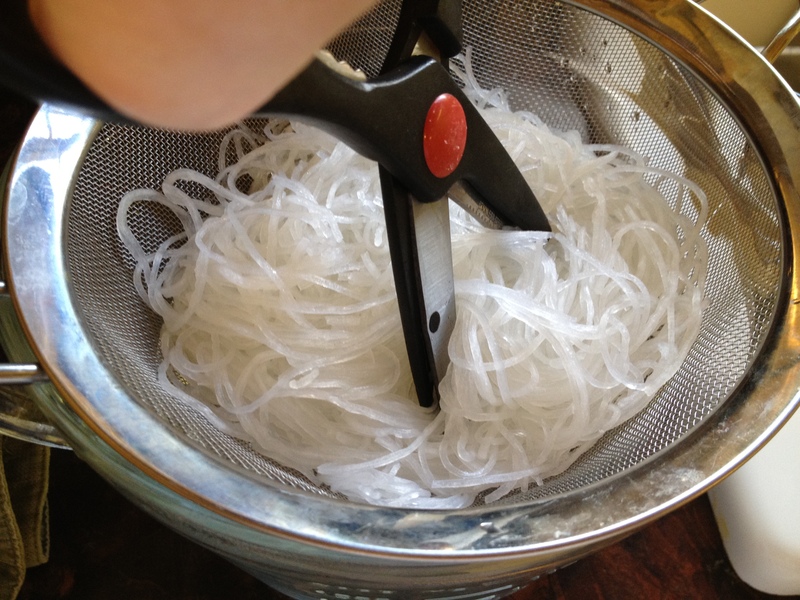 Use a whisk to mix it very well. Side Note: If the egg whites and water aren’t mixed well, when you get mostly water on the egg rolls and put them into the hot oil, the oil will really spit and spatter which means you get burnt. 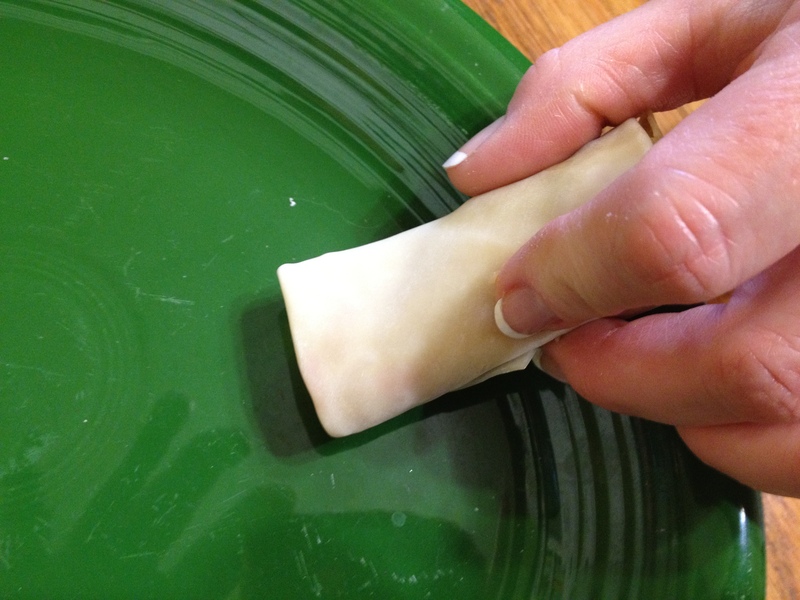 To brush the egg wash onto the egg roll, hold the egg roll in your hand, flap side down, so the flap can unfold just a little bit onto your fingers. 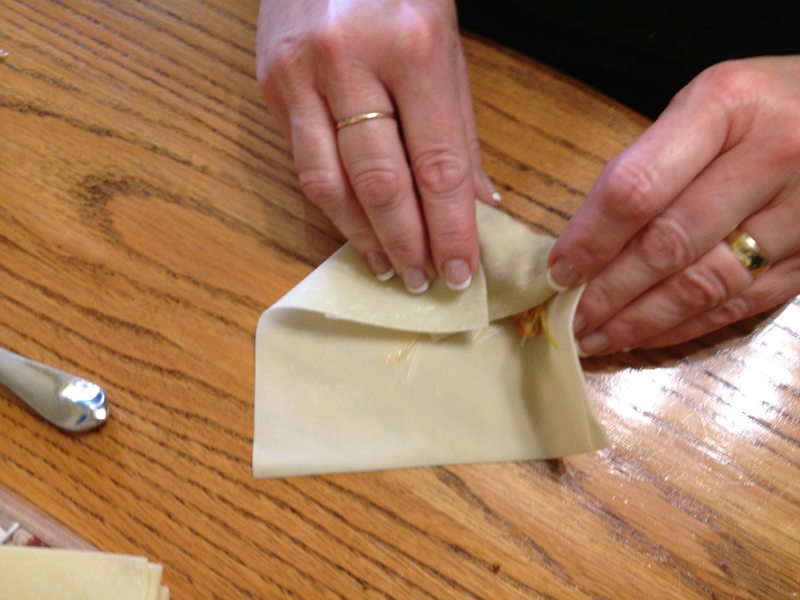 Brush the egg wash on the top part of the open flap, then using the brush from underneath the flap, bring the flap back up into place and continue brushing the rest of the egg roll. This will seal the flap and keep it from unrolling in the oil as it bubbles. Don’t be too stingy with the egg wash but don’t be too liberal either. You don’t want them soppy but they will be slick so be very careful when putting them down into the oil. I know this isn’t the best picture in the world but you can see how glossy the egg wash is on the egg roll. Not too much, not too little. But again, be careful because they’re slippery lil rascals! Just be careful not to “drop” ’em in so you don’t get splashed. Don’t brush more than you’re going to put in the skillet at one time. Depending on the size of your skillet, on average, Tom puts in 5 or 6 at one time in a 12″ skillet. You don’t want to crowd the pan and you need to keep an eye on the oil temp. It doesn’t take but just a few minutes before they start to get brown. The egg rolls at the top of the picture are ready to turn while the ones closer to the bottom have about a minute more to go. Those are some happy egg rolls in that pool!!! When they’re brown on the second side they’re ready to exit the pool. Drain them in a colander lined with paper towels for a few minutes. You wanna be sure to stand them on end. If there’s any oil/liquid to drain, it’ll come out the end rather than staying inside the egg roll – that would be a bad thing. And there you have it!!!! Print yourself a Certificate of Achievement (with the fancy gold-foil border) for successfully making egg rolls!!! Congratulations – now go throw confetti all throughout the house!! Enjoy them – you’ve earned a huge celebration!!! SIDE NOTE: These can be frozen after they’re wrapped but BEFORE you put the egg wash on them. Line a cookie sheet with parchment paper and fill the pan. Be careful they don’t touch. Put them in the freezer for a couple of hours then in a ziplock bag. 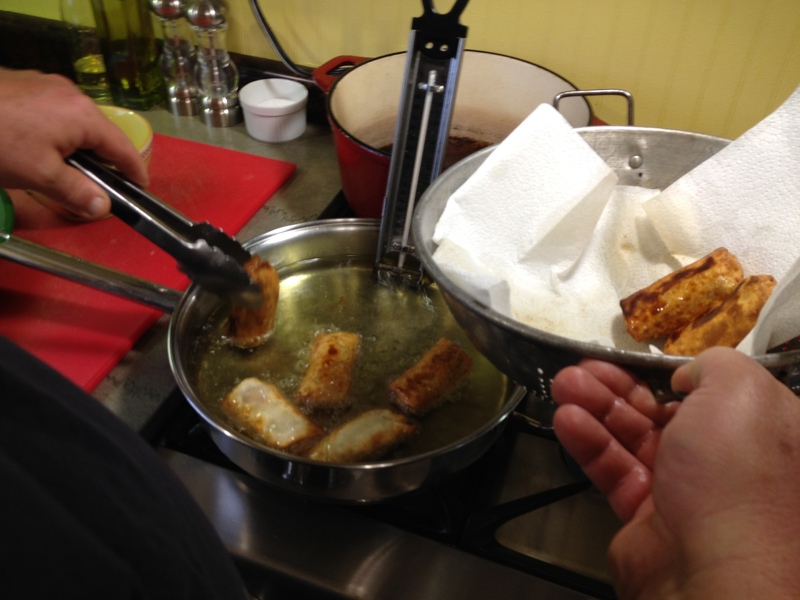 Later you can pull out however many you want to thaw, brush with egg wash and fry. I personally have not done this but my friend Susan did and she said they did great. Now you’ve made something you thought you’d never be able to do!! One more culinary accomplishment in your repertoire! See, all you had to do was trust me!! Thanks for spendin’ some time with me and congrats again! It is true… I’m not a fan of egg rolls, but love these! Now I have even more respect for all the work it took you to make them for us at work! It’s really crazy!! I don’t know what it is about them but like I said, people that don’t normally care for egg rolls do like them. See, now you can get together with your friends and make a whole mess of them and take your leftovers school the next day!!! If there’s any left! Gee whiz Therese!! I’m so sorry for the delay in getting a reply to you and everybody else but I just tonight figured out how to “reply” to comments on the post. I think I sense an egg roll evening coming SOON now that things are quieting down. I’m ready at a moments notice (and a fast trip to Wallyworld for wrappers)!! We’ll have to take all kinds of pics with all of us posing with smiles like in the catalogs so everybody will see that they’re as fun to make as they are to eat!! Wait, I think that’s something else. Thanks for coming to the site to check it out. How about if you guest post some time? You’ve got some WONDERFUL things in your repertoire! !